Brief Synopsis – A con-man tries to work his magic on a small Iowa town where he claims to be able to create a marching band. My Take on it – This is a film that I have seen so many times in my life because it is one of my mother’s favorite films and we use to to watch it all the time when I was a kid in the 80’s. The songs and music are extremely memorable and I found myself singing and humming along throughout most of this film. The problem hee is that the story itself isn’t so great and that takes away from how impactful such a film can be. 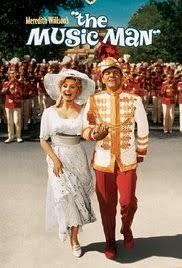 Robert Preston and Shirley Jones are great as the two leads and they have really nice chemistry together. I have always loved seeing a very young Ron Howard in thsi film especially when he sings Gary, Indiana. This film was nominated for 6 Oscars that year but only managed to win Best Adapted Score. Bottom Line – Movie that is much more memorable for it’s music than for the story itself. Preston and Jones are great and have nice chemistry together. Love seeing a young Ron Howard in a pivotal role. Nominated for 6 Oscars, but it is clearly one of the weakest films nominated that year. Haven’t seen this film too many times – but 2 of my children have appeared in the musical stage version – my son in middle school and my daughter professionally last year in summer stock. Some beautiful songs as you said. One bit of trivia – “Til There Was You” was covered by The Beatles early in their career – sung by Paul McCartney – and became a hit single in the US. I agree too that of the 5 nominees for Best Picture in 1962 – this is definitely the weak link. It was in the waning days of big movie musicals and may have snuck in on that residual goodwill. But it had no chance amongst this competition.